Reference number for this case: 9-Oct-54-Uzerche. Thank you for including this reference number in any correspondence with me regarding this case. Aimé Michel notes that an observation occurred on October 9, 1954, in Uzerche in the Corrèze. He indicates the newspaper Le Figaro of October 11 as source. 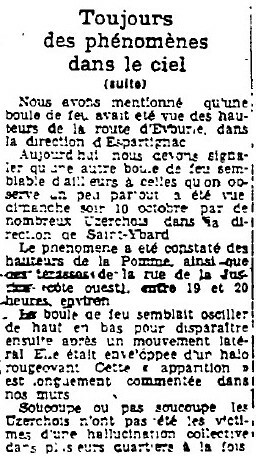 Luc Chastan indicates in his database that in Corrèze in Uzerche on October 9, 1954, at an unknown hourthere was an "Observation of an object." The website indicates that on 9 October 1954 there was a sighting in Uzerche, France. The source is noted: Michel, Aime, Flying Saucers and the Straight-Line Mystery, S. G. Phillips, New York, 1958. 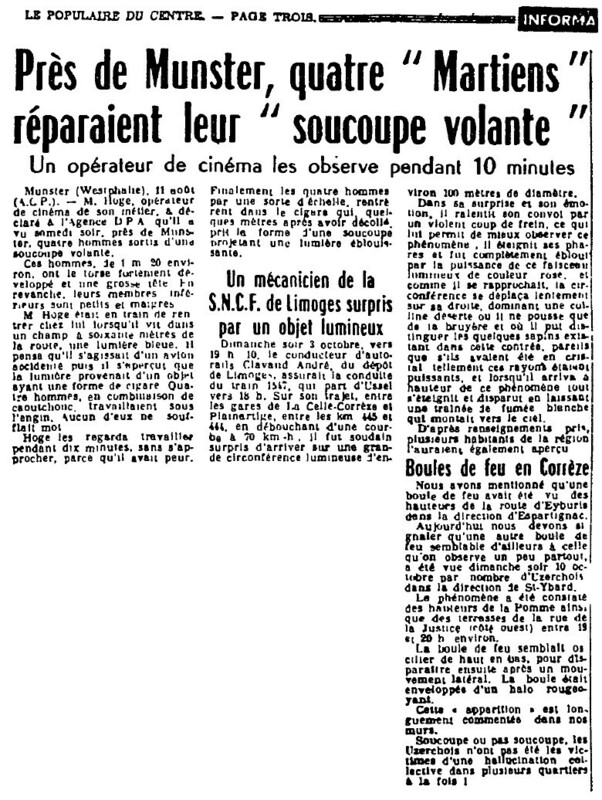 [---] Article in the national newspaper Le Figaro, October 11, 1954. 1.1 Patrick Gross December 23, 2016 Additions [pc1], [dm1], [ub1].